Bali Kintamani village is the object of mountain tourism is very unique and stunning with cool air condition in the day time and cold at night time. Bali Kintamani Village is 1500 meters high, the village of Kintamani his a cool, damp climate suited to growing oranges and passion fruit and on market day, which falls every third day, the main street becomes a bustling chaos of vendors, some of whom have traveled from far away, carrying their wares on horseback. Kintamani is the object of mountain tourism is very unique and stunning, with cool air condition in the daytime and cold at night. Tourism Object is located in the area is located in the village of Batur Batur, Kintamani District Level II Regional District Bangli. As for the route object, Object linking tourism with the Tourism Regions Tourism Batur and Besakih Tampaksiring. To reach these locations, can be taken through the journey overland from Denpasar for 2 hours, exactly to the place called Penelokan. In accordance with its name in Balinese, Penelokan means most strategic place to see the sights of nature in this tourist location. Located in the region Penelokan Kedisan village, one village in Kintamani District. 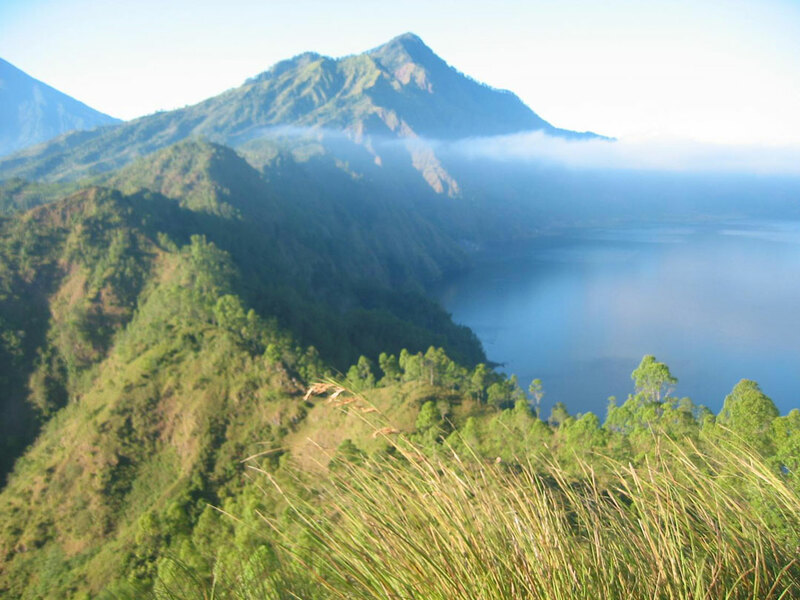 We can watch stunning natural scenery of Penelokan, a combination of Mount Batur and the expanse of black rock with Lake Batur and on a blue caldera. According to the tourists often called the world's most beautiful caldera. Because the number of tourists grew, Penelokan already has an adequate infrastructure facilities complete with lodging and restaurants. Location interesting addition in the Village Penelokan Terunyan. For there to be through the center of the village Kedisan then crossed the lake. Village Terunyan, we can see the ancient civilizations of Bali Bali aga. In this village, the people who have died simply placed under a tree. The corpses are not completely remove the smell. One of Bali’s most famous village, Kintamani, is located on the scenic regency of Bangli. The fresh air from the mountain combined with dizzy view is best enjoyed by cycling around the village or trekking. The dramatic landscape of the village centers around the volcanic caldera of ancient Mount Batur having deep crater lake, Bali’s largest, and bubbling hot springs. The village is also home to several temples. One of which is Pura Ulun Danu Batur by the rim of the crater which completes the already breathtaking natural view of Kintamani village. When tourism started to develop in Bali around 1965 one tour package called "Barong dance and Kintamani tour " was the most popular day sightseeing. The highlight of the tour which is until now still exist are Bali artist's colonies, Tirta Empul Temple, and Batur Caldera. According to some senior tour guides who have been working in the industry for more than 2 decades some tourists from Europe and U.S.A regularly come to Bali, for more than 5 times since 1960s. And every times, they come they always repeat to see this tour package. It might be the real spirit of Balinese nature and culture are mixed here which can give various inspirations, probably from business of small handicrafts until 5 stars hotels or restaurants for those who saw this as an opportunity. This has been proved by the tremendous development of tourism facilities in Bali from 1980s to 1995. The writer believe very much that what is the value of this trip has been triggering other area of Bali to be known in tourism industry. Below is described shortly how these 3 areas had been attracting people from immemorial times. Inscription dated 911 AD, mention about the king envoys to pray at Trunyan village, the local people were asked to serve the envoys to prepare the meals and facilities during this religious trip. The people requested to his majesty to be exempted from certain taxes in lieu to the services rendered to the philgramage. Inscription dated 911 AD, the regulation for village member between Abang village and Trunyan village was issued by the king to protect their interest. Three inscriptions found at Kintamani dated 967 AD mentions a lodging ( pesangrahan ) at Air Mih, licensed by the king Tabanendra Dharmadewa. Just around 1 km north to Kintamani have found various stone sculptures carved in 1011 AD by master sculptor "Mpu Bga", dedicated to the king and ancestor's spirits. 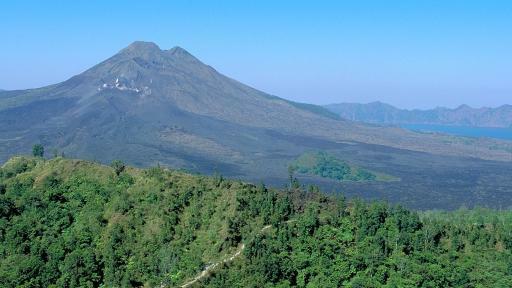 It is a prove that Kintamani area is the oldest area to have been recorded in history of Bali. It was probably due to it's very inspiring natural scenery and magical view. One of famous Indonesian novelists Sutan Takdir Alisyahbana also built his lodging on the foot of Mount Batur, where he produced many litteraire creations in the form of romance or novels. There are several sources that mention the history of Batur is Lontar Kesmu god, Lontar USANA Bali and Lontar King Purana Batur. Pura Batur mentioned that already existed since the time of Kuturan Professor X is about a century until the beginning of XI century. Because the vast acreage and-pelinggih number is estimated that pelinggih Pura Batur is Penyiwi kings who ruled in Bali, as well as a heaven Jagat. Is the story, happened in the month of Marga Sari (month-to-V) when Krishna Force (Tilem) called Bethara Pasupati in India are transferring summit of Mount Meru is divided into two, held by the left and right hand and then brought to Bali is used. The Son he is sthana Bethara Putrajaya (Hyang Supreme Deity) and peaks that brought his left hand into Mount Batur as sthana Goddess Danuh, both that as ulunya island of Bali. Both mountain is a symbol and Pradana Purusa elements of Sang Hyang Widhi. Pura Batur is a Hindu cult place throughout Central Bali, Bali in particular, North and East plead in the field of safety rice field. Hence, in the revered saint who fell the Purnamaning to X (kedasa) all the people, especially in all kelian subak, sedahan-sedahan come to Pura Batur to offer “Suwinih”. So if there’s disaster pests. Source: Bali Golden Tour, Bali Sunrise Tours, Travel Online.